Without good launch software, even the hottest new console's little more than an expensive pile of plastic and silicon. Luckily, PS3's got an ace in the form of Insomniac's retro-futuristic first-person shooter Resistance: Fall of Man. Unlike most of the other PS3 games, Resistance has some serious next-gen cred. While not super innovative, Resistance features an enjoyable single-player campaign and facilitates impressively busy online shootouts. Oh, and it looks pretty darn hot, too. 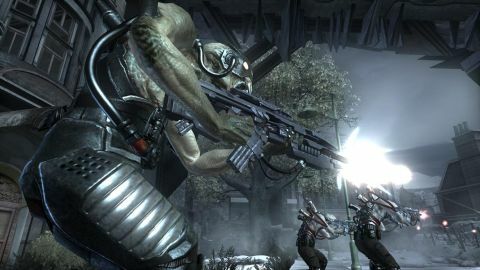 One of Resistance's cooler aspects is its imaginative storyline, which takes place in an alternate reality in which World War II didn't occur. Alas, there are other problems, not least of which are the Chimera, a race of inhuman monsters that silently encroached over Asia and Europe throughout the '30s and '40s. The game begins in July 1951. England has finally fallen to the beasts and America mounts a last-ditch effort to intervene (this wasn't by any chance developed in America, was it?). Sgt Nathan Hale is among the first on the scene and proves resistant to the Chimeran virus that wipes out most of his buddies. Thus he's launched into a lonely, four-day struggle against the otherworldly menace, with the fate of humanity resting on his shoulders. No pressure, though. Description It's got looks, it's got brains, it's got a lot of stuff to shoot. It doesn't revolutionize the genre or even introduce much new, but Resistance remains an utterly solid shooter.